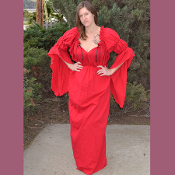 A full length gown with an empire waist, also features our signature sweetheart neckline. The glorious drop sleeve gives the feel of a short sleeve without compomising style. Wears well by itself or topped with a skirt and bodice or corset. Shown here in red cotton.